Contact details for XiVA musicm8 entertainment server. XiVA musicmate is the home entertainment server that allows you to store and browse music, photos, videos and stream them to your iTunes server, Sonos, LinnDS, Logitech Squeezebox, PS3, Xbox and more. Please e-mail if you wish to contact XiVA about the musicm8 entertainment server. 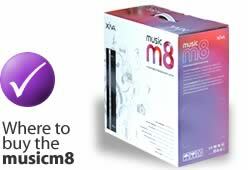 We are always happy to help with any problems or queries you may have regarding the XiVA musicm8. However please take time to read through the selection of the most common questions and answers on the FAQs page. You can also download the Quick Start Guide and User Guide for the XiVA musicm8 on our Support page. To find your nearest retailer or distributor please visit the Where to Buy page.